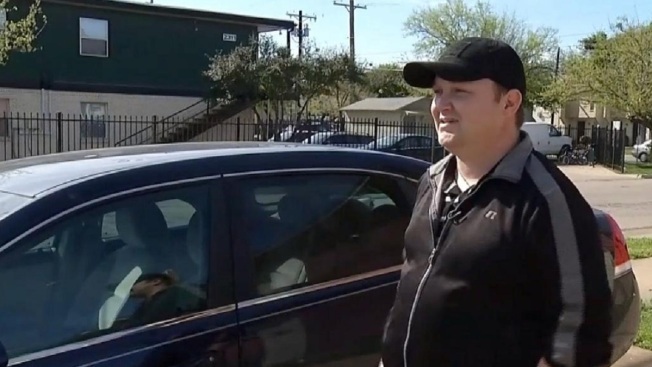 A Denton man thought he needed to go to the hospital after he was hit by a softball-sized piece of hail Thursday, but ended up with just a bad bruise. Cash Cooper had just picked up his 7-year-old son from school when hail the size of softballs started dropping from the sky. "It was hitting. It was really loud,” Copper said. “My little dog jumped on the floorboard and she went under the seat." He said he rolled down his window for a second to try to snap a photo and also because he thought his window was about to shatter. He never had the chance to take a picture. A piece of hail hit him on his left side, leaving a black-and-blue bruise. "It just came curved and straight through and hit me in the side,” Cooper said. "It felt like my kidney ruptured, really. I mean, I thought I was going to the hospital. It was bad." Cooper's car is full of dents, including a big one on the roof right above the driver’s seat. "If that was my head I'd probably be dead,” he said. The same hail storm damaged a Wal-Mart in Denton and the roof of a dormitory building at the University of North Texas. Meanwhile, windshield repair companies in Denton have more business than they can handle. "I'm trying to help people and make money,” said one repairman. Cooper said his experience has given him a new respect for Mother Nature. "It reminds you every once in a while how small you are,” he said.